Home › Football › The sport hormone? A review by Gert-Jan Pepping and Erik J Timmermans, published in September, 2012, in The Scientific World Journal, argues for oxytocin as the biochemical basis of such emotion transfer that can lead to enhanced performance in team sports. 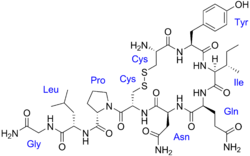 Via its action as a peripheral hormone and a central neurotransmitter, oxytocin modulates a diverse range of mammalian processes. Peripheral effects include regulation of uterine contraction during labour, stimulation of lactation, and modulation of inflammation. Oxytocin receptors are expressed by neurons in the brain and spinal cord, and it has been shown to affect pair bonding, maternal behaviour, and sexual receptivity. Oxytocin is destroyed in the gastrointestinal tract, and does not seem to cross the blood—brain barrier when given intravenously, so its effects are studied in animals by injection of a synthetic form directly into the brain, and in humans via administration of a nasal spray. Oxytocin is often referred to as the feel-good hormone, because it is released in response to touch and is associated with feelings of calmness and stress reduction. A positive feedback loop means that higher oxytocin concentrations further increase the desire for tactile interaction. This association seems to be the basis for its role in promotion of mother—child bonds and fidelity in monogamous pairs. A study in the Journal of Neuroscience provided behavioural evidence of oxytocin’s involvement in maintenance of bonds among committed couples. After administration of intranasal oxytocin, men in monogamous relationships kept a greater distance between themselves and an attractive researcher than did those given placebo, and approached an attractive image more slowly, whereas no such effect was seen with single men. No wonder oxytocin is also known as the love hormone. In their review, Pepping and Timmermans outline the argument for giving oxytocin yet a third moniker—the sports hormone. Positive emotions and prosocial behaviour are associated with improved performance in achievement settings in general, hence increasing investment in work environments that enhance team spirit and boost individual motivation. In sports, emotional expressions underpin the continuing exchange of information and mood between teammates and opponents. An emotional display by one player can inspire a similar mood in teammates, and the team’s overall disposition can motivate individual performance. 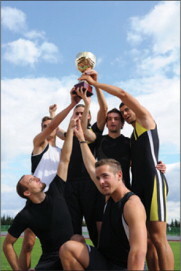 This convergence of mood, or emotional contagion, is a key element in team unity. Measuring a player’s hormone levels during competition is a logistical challenge, but the studies reviewed by Pepping and Timmermans show that, in controlled settings, oxytocin affects processes central to emotional contagion and social perception. Empathy denotes cognitive ability to adopt another person’s point of view, or emotional capacity to have a shared feeling on the basis of another person’s experience. Cognitive empathy is an important quality for an athlete, since it allows them to understand and predict other players’ behaviour, and emotional empathy contributes to convergence of mood (and motivation) among teammates. The Multifaceted Empathy Test is used to measure empathy, by asking study participants to rate emotional reactions to pictorial stimuli; those given one dose of intranasal oxytocin before the test reported higher empathy than those given placebo. Intranasal oxytocin also improved performance on the Reading the Mind in the Eyes Test, which measures participants’ ability to infer a mental state from subtle facial cues. Reading emotions such as fear or determination in other players can help athletes make quick decisions about their own actions, and oxytocin seems to be a key biological component for processing these social cues. Pepping and Timmermans describe a study in which MRI showed higher brain activity in specific regions associated with emotion recognition when participants given oxytoxin (vs placebo) were shown images of facial expressions. One dose of oxytocin also improved recognition (ie, at lower intensities) of an emotion emerging on a dynamic, computer-generated face that started with a neutral expression. Studies showing an effect of oxytocin on gaze behaviour suggest a mechanism for how it modulates emotion recognition, and provide further evidence of its involvement in social exchanges. Tracking the eye movements of men given intranasal oxytocin (vsplacebo) showed longer gaze duration and fixation on the eye region of neutral faces. Eyes are the main source of information in interpersonal communication, and gaze behaviour is central to impression-forming among athletes. Sports psychologists have studied gaze behaviour in the context of football penalty kicks, to define the best kicking strategy (eg, to look or not to look at the target), but from a goalkeeper’s point of view, kickers who gaze directly at them for longer create a more imposing impression. To the extent that oxytocin is involved in detection of confidence or fear, a boost in either party could make the difference. At the elite level, in which superior talent is universal (and modesty in interviews is advised), team unity is often credited for a win. Trust, generosity, and cooperation are indispensable processes for building and maintaining team cohesion, and according to Pepping and Timmermans, oxytocin is once again involved. In games with monetary stakes, individuals given oxytocin make trusting decisions more often than those given placebo. People are also more generous under the influence of oxytocin; when asked to make a masked, one-sided decision on how to split a sum of money with a stranger, a group given oxytocin was 80% more generous than those given placebo. Oxytocin enhanced cooperative decision making when participants played games with economic incentives to cooperate. Stronger incentives lead to greater cooperation, but only if social information was present. When social information was absent, players who received oxytocin were actually less cooperative, which suggests that the oxytocin system intricately modulates risk-taking and risk-aversion in social exchanges. With so much evidence for oxytocin’s role in athletic performance, particularly in the context of team sports, will players be stashing oxytocin inhalers into their equipment bags for a quick hit mid-game?Pepping and Timmermans point out that oxytocin’s effects are not universally prosocial. Compared with placebo, oxytocin administration increased ratings of envy (ie, a negative emotional reaction to another player’s good fortune) and gloating (ie, malicious pleasure at another’s misfortune) in economic games designed to elicit these negative social emotions. Athletic pursuits are awash with relative gain and loss situations, and keeping composure is important for success, so an artificial boost of oxytocin could be ill advised. As professional cycling joins the rogue’s gallery of sporting doping scandals, talk of another performance-enhancing drug might seem distasteful. But research suggests that there are subtle ways to improve ability through the natural stimulation of oxytocin, which will always be legal. The high-five, the fist-pump, and the group hug remain staple elements of sporting life, and dosing up on a little more might just make the difference between winners and losers. ‹ How fair is youth sport and is it helping our children? Understanding relative age effects in sport.